The Eastern Wild Turkey is enough to impress anyone who sees it for the first time. The Eastern Wild Turkey is a smart and highly adaptable bird. 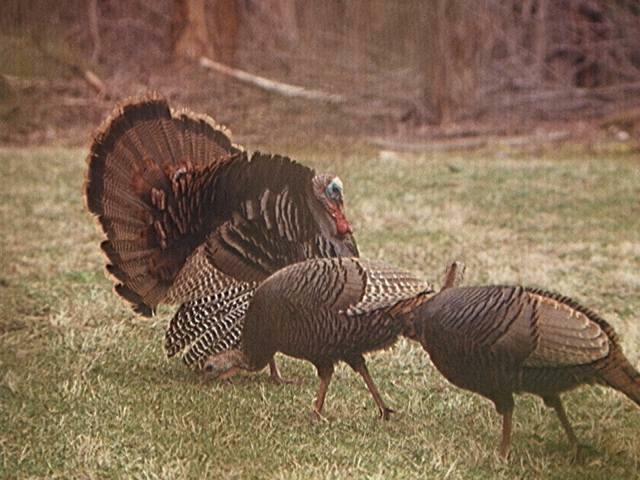 Adult males, also called "toms or "gobblers", have red, blue and white skin on the head during the spring breeding display. They have a long bread of hair-like feathers on their chest and leg spurs that can be from 1/2 inches to 1 1/2 inches long. Their call is a grobbler. The tom has a dark-brown body. Mature males are about 2 1/2 feet tall and weigh up to 25 lbs. The adverage weight is 18 to 20 lbs. It is found in Eastern Texas, Northern Minnesota, east to Vermont and New Hampshire, and southward through Georgia, Alabama, Mississippi, Louisian and Arkansas. The Eastern is dark metallic colored with brown tail tips. The females are duller in color. Hardwood ridges with pockets of white pines and hemlocks, surrounded by open pasture or cropland, describes the unusual habits of the Eastern Wild Turkey. Due to their will to survive, and as their population increases, the Eastern Wild Turkey have been seen in areas that don't fit the above desciption. As long as they can find food, a secure place to hide, and tall trees in which to roost to protect themselves from predators, they will adapt. With their varied diet, food is not as much of a problem for them as their need for trees to roost in. During the breeding period, the male Turkey puts on a spectacular display. He spreads his tail, swells out his wattles, and rattles his wings, gobbling and strutting the whole time. Turkey roost in trees and feed on the ground on insects, berries, seeds and nuts. Warey and difficult to approach. Turkey can fly well for a short distance but prefer to walk or run.